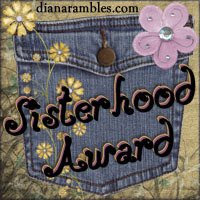 Heavenly Housewife has given my blog the Sisterhood Award! We seem to have much in common - we're both LOLs (ladies of leisure), we ALWAYS have food on the brain, and we're constantly planning our next foodie adventure (I tackle the Tri-state area, while she's across the pond in England). 2. Nominate at least 10 people whose blogs you enjoy. 4. Let them know they have received this award by commenting on their blogs. 5. Share the love and link to this post and to the person who has nominated you for the award. Tangled Noodle, who’s probably received several sisterhood awards by now but IMHO deserving of many more. I first took note of her intelligent blog when she co-hosted the Eating Your Words challenge. Most recently she searched through Minneapolis for century eggs, determined to make my century egg and pork congee. Oyster Culture: “A place to exchange ideas and learn about culture through food”. I learn something new every time I read one oysterculture's well-researched and fascinating posts! Last week she included a delicious recipe to celebrate Nowruz (Persian New Year). Coconut Girl Live! Join Coconut Girl Connie for some “island inspired living” in Hawaii. Her delicious Hawaiian-style recipes will have you saying Mahalo! She Simmers: The "highly nomadic" and extremely witty Leela showcases ethnic ingredients in simple no-fuss recipes. Pham Fatale Jaqueline Pham’s French-Vietnamese background coupled with her husband’s Indian heritage make for some clever fusion recipes. seasaltwithfood: A fellow Vancouverite takes exotic ingredients and makes them non-threatening in easy family recipes. Passionate Eater, based in San Francisco, has the most gorgeous food photos on her blog (her “fugly”-est food pictures are probably equivalent to my best photos). I’m also digging her Internet Food Deals of the Week feature. 5 star foodie’s on a mission to eat at all of the exclusive 5-star restaurants featured in Mobil’s Travel Guide. Gourmet recipes simplified, like her chilled avocado and cucumber soup. She also shares her secrets to making the perfect smoothie. And finally, when I get homesick for Malaysian food, I check out Glancing thru MY crystal ball for some yummy photos of laksa and other local specialties. Shout-out to Kuching, my hometown! A double hooray for sisterhood! yeayy!!! thanks!! :) hehehe.. ohhh... when homesick, u seek me la.. hahahha.. :) thanx luv!! I am honored by your Sisterhood Award Phyllis! We as food blogging sisters also have a lot in common, in that we love crazy-unique Asian "delicacies!" I too am a LOL, in that I love to veg and eat and eat and veg!